In this series, we feature the insights and ideas of our Vol. 03 contributors. In what ways has Iceland informed your work? I came to Iceland with an open mind. I didn't know what to expect in terms of my work and was ready to experience just about anything. I just finished a solo exhibition and was at a crossroads of where to take my work next. The month I spent in Skagaströnd solidified the direction I was already on but also got me interested in the relationship between the interior and exterior of our homes. Experiencing some of the most beautiful, yet harsh weather highlighted the importance of warmth and safety, especially in the chilly winter months. Having a whole month to myself surrounded by the sea, mountains, and snow also liberated me and opened up my creative practice to landscape sketching and photography. I'm not sure how it will all connect and maybe it never will, but being in this amazing country sure opened all creative senses and made me want to respond to what I was experiencing. What drew you to Iceland in the first place? I was drawn to Iceland since high school. I was a huge fan of Sigur Rós and when I initially started to research them, I was struck by the beauty of their country. The fascination and love never really subsided. Over the years, I watched friends and colleagues visit and knew I had to make a trip. Last year I applied for the artist residency at NES and committed to spending a month there. As an artist, how does travel help or hinder the creative process? For me, travel helps me shake out the daily cobwebs and gain clarity about who I am and what kind of art I want to make. It's not always an obvious reflection of where I visit that can be seen in my work, but I always feel renewed after visiting a foreign country. Participating in artist residencies helps me tremendously. There is nothing like being submerged in the studio with a group of creative people, brimming with new ideas. I always learn so much from both the locals and people I meet on my trips. How do you think locals view traveling artists/scholars/researchers (either in Iceland or beyond)? So far, I had pleasant experiences. On my residencies in Greece and Iceland, I felt more than welcome. People are usually eager to chat, share knowledge about their homeland and encourage you to try their food or experience their culture. Being friendly with the locals is the quickest way to learn about your new environment. Ekaterina Popova was born in Vladimir, Russia. After moving to the United States, she fell in love with painting and received a BFA from Kutztown University of Pennsylvania. Her work has been exhibited nationally, including Art Miami Fairs, The Trenton City Museum, Delaware Contemporary, Uforge Gallery, The Painted Bride Center, The Boxheart Gallery, A.I.R. Gallery and more. She has been featured in multiple blogs and publications, including Aesthetica, The Jealous Curator, Artistic Moods, Art Reveal Magazine, and Professional Artist Magazine. 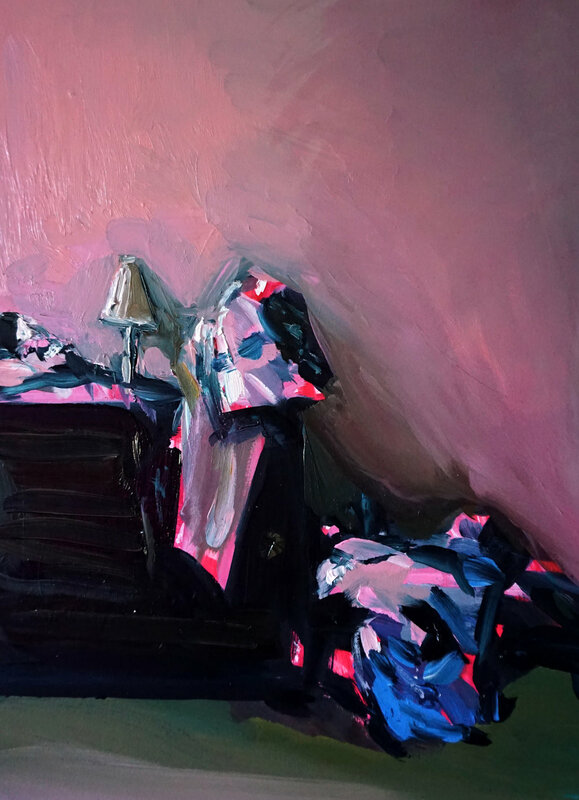 Most recently, her work was on view at The Painting Center, The Other Art Fair in New York City, and published in The World of Interiors Magazine.